It is a hard story for me to talk about for many reasons. It brings back bad memories and puts me and my family in a suspect light. 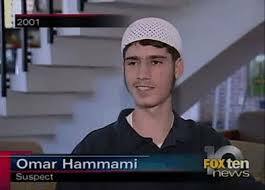 But I know that people can benefit from the lesson of Omar Hammami’s journey and death. It is a cautionary tale. Many people try to paint him with broad strokes. The FBI called him one of their most wanted. CNN called him a Jihadist rapper. Fellow jihadis call him a hero: those were the same people that later killed him. He called himself Abu Mansoor al-Amriki. To me, Omar Hammami was a kid. I met him when I was first introduced to my husband to be. In those days my husband, Omar, and a few other convert brothers travelled together in a pack. Omar, while one of the youngest pack members, was often the loudest and most energetic. A scraggly-bearded teenager in thobes, Omar was a frequent guest in my home where he would chat for countless hours with my husband, share meal with us, and on occasion eagerly offer his help when we were in a bind. He was a good friend to my husband and me. But in his experiences from Alabama to Somalia, Omar became the perfect mix of an impassioned, angry and frustrated young man. Read the rest of my article at OnIslam.net to find out how Omar fell prey to radical ideals, joined a terrorist organization and was murdered by that same organization, and why it matters. Yes, same here. I have saved the link to read it and really sorry for your loss and the loss of this young man, another reason why we need to unitedly work on eradicating terrorism. Bless you forever, for all that you do and all your compassionate work sister. In solidarity. Hugs! JZK. We really do need to reach these people before they go down this path. But I think if ISIS has done anything positive, it is to show these young people who may be vulnerable to jihadi propoganda that it is so apparent that it is contradictory to the Prophet’s message. May Allah (swt) protect us all from ideals that He’s displeased with! Ameen! What happened to my comment ? They were in spam. No idea why. It’s sad story, Sis. After reading about him on Onislam.net, I suddenly remember, his name is same to Caliph Umar bin Khattab. Caliph Umar before converted to Islam was a hard man, and get angry easy. But, after converted to Islam, his manner became beautiful, patience, and had soft heart . I just can pray for him, may Allah forgive his sins and place him in a nice place. We dunno about his life in barzakh. Allah A’lam. . Thank you for reading and for the dua. Don’t mention it, Sis. We should pray for our brothers n sisters. Many positive things I can see from Muslim converts. They have high spirit to spread Islam, and I think they need good guiders who can guide them to Islam way well. If they follow the terrorist groups, oh…. they take the wrong ways, because Jihad isn’t make any terrors. May Allah bless us all. Ameen. Ummmm. I completely understand fighting for the greater good and I understood that that was a part of what Omar was doing. He couldn’t sit back and do nothing. I get THAT. But the bigotted view Americans he adopted, the group he joined, and the cause he fought for were all Ill advised -to say the least- and extreme. I and many women absolutely understand the urge to fight for the greater good. This has nothing to do with gender. The impulse to use violence in that struggle might have something to do with gender. However whether it is from men being hormonal or if it is just taught behavior, I cannot say. So what you are saying is that for men it has nothing to do with the greater good but the pressure to fight for something? Having male children, I totally understand what Hyde is saying. There is a large % of guys who do have that need. I think finding a way to make this natural “fight” constructive and productive is a complex challenge that would require an enormous amount of self discipline. I can’t help but think that there is an underlying zeal of power involved in this, and until we begin glorifying the peace keepers and the creators over the conquerors and “bad-asses” , I don’t think things will change much. Just look at who is celebrated in movies and in sports. If men who stand out in this way are rewarded with praise and women etc.. then what do we expect in society? You would have to foster a different cultural construct where collaboration and harmony was considered masculine- you would have to redefine manhood. Oh bless ya! This is exactly what I mean. Ask your boys when they become teenagers who are there role models, rappers, athletes, “playas” ? I don’t feel like writing much and I can write so much on this….but what does it mean to be man anymore. I think a part of it depends on how those around you define it. For example it can be really awkward for a male Westerner working for a company in the Middle East having everyone they are introduced to ask how many kids they have when they are are clearly in their late 30s and have one or none. I have had known people who complained of this, because they felt like their “manhood” was questioned because of this family status symbol- where as back home in the USA no one would question it. Another example- the shaming of the virgin dude in high school for not having enough notches on his bed post in the West- again totally dependent on where you were raised and your immediate surroundings. If you are a virgin dude somewhere else- where it was okay to not be experienced- it would not seem like a big deal. It is interesting that a persons own opinion of self is wrapped up in others opinion of him-but true. So what it means to be a man will vary depending on environment. Islam fosters a different cultural construct. Abu Huraira reported Allah’s Messenger (may peace be upon him) as saying: The strong-man is not one who wrestles well but the strong man is one who controls himself when he is in a fit of rage. Unfortunately, culture is perpetuated by what those around you value. If your religion is Islam and even if you live in a “Muslim” country, but those around you value different things based on their parents or what is historically valued-or what movies their communities have been lovin’ the last 50 years- then what Abu Huraira reported is not going to have the impact we all hope :(. I think people have a strong need to seek external confirmation from those they know best- their family and peers -coupled that with the material rewards that accompanies some of these “traditional” male characteristics makes it very hard to resist. I do agree Islam does redefine it- what is painful though is that guys still seem to prefer telling the conflict /war/glory parts of Quran than the compassion/forgiveness parts. Certain cultures seem to be more motivated by punishment and concepts of revenge rather than mercy. I don’t pretend to understand it, but these are also more male dominated cultures that I happen to be thinking about. If someone could explain that to me I would be all ears. I would be all ears as well.